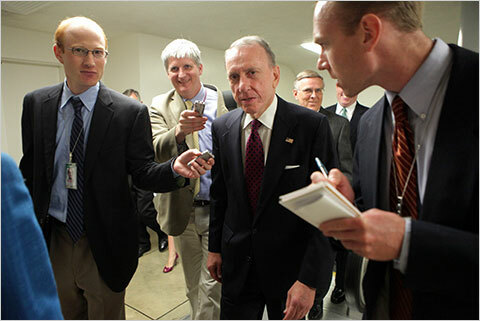 When I read that Arlen Specter switched parties yesterday, my jaw dropped to the ground. I don't think anyone saw that one coming. The impact of his switch is glaringly obvious. The Republican party is too extreme for Specter and the voters in PA. Again jaw drop. I'm not sure if there is more to say on that score. the announcement could hardly have been better for the White House. vote in the GOP primary, shrunk last year. necessary as a simple matter of political survival. case any liberal challenger might try to take him on in the Dem primary. I'm in reading/linking mode on this topic. I'll share the good stuff. Oh, I like Dan's post. when your team, already up by four touchdowns, scores yet another. Let’s call it the joy of pulverization." pigs in a thunderstorm, maybe." Next > What Was She Thinking? As PA residents, we were thrilled. 🙂 My husband said it was the best day of his life. Honestly, I would have voted for Specter over Bob Casey in a primary. I haven’t always agreed with Specter, but I think he thoughtfully considers the positions he takes. He doesn’t just take them for political expediency. Otherwise, he’d be a right to lifer. While his party switch may, in fact, be chalked up to political expediency, I think it’s clear that the GOP didn’t want to support his candidacy. They want another serious conservative, not a middle of the road guy. That tells you something about the direction of the GOP. All its talk of being more inclusive is hooey. Ponnuru is right. The interesting thing about those party switchers who switched to vote in the Democratic presidential primary is that many of them are pretty damn conservative (I know, because I work a polling place), and they obviously weren’t polled because they’re not listed on the registration sheets anymore. I doubt they’ll all manage to switch parties in time for the primary. Therefore, they won’t vote, and actually, probably won’t even if they manage to switch. Turnout is around 10% for primaries (with the exception of the Dem Pres primary last year). It’ll be interesting to see what happens. I think that’s the real key. Specter’s not going to change when he identifies himself as a Dem. I don’t think that this going to mean “automatic” cloture votes, because his vote will still have to be won. But, the Dems said they wanted him anyway Clearly, the wooing by Biden + the official support of Obama + Rendell was extremely important to Specter, ’cause it said that he *was* going to be helped by the Dem power structure to hold is seat. Contrast this with Steele’s very public statements that people who broke rank (on the stimulus bill, for example) were going to be punished by the Reps.
(My jaw also dropped. I was motivated to put up an entry in my blog (which is personal, and password protected) titled “my oh my” just to remind myself of when I first saw the news). What do you say, Siobhan and MH? Are we heading for another civil war? HA! Great quote, bj. I’ll put it in the main post. I voted for Specter in the primary and the general. I know a few Dems who voted for him in the general. Would I have voted for him in 2010? Maybe, but really voting against him is the only potentially meaningful vote against the bailout that I had, so probably not. I was so pumped up when I read the news that I spared a few precious moments in between classes to go tell my chair, who shares my political beliefs and likes to rant with me. She was crushed! “I don’t want him!” she said. I was surprised to see so many Dems/liberals/netrooty people who were upset by the news. Maybe your chair is concentrating on the second part of the “More and better Democrats” netroots agenda, Wendy. Perhaps she was counting on Toomey taking out Specter in the R primary, and then losing to a better Democrat in the general. Growing up where and when I did — in the South in the 1970s and ’80s — I heard a lot of, “I didn’t leave the party, the party left me.” Looks like it’s the Republicans’ turn. Question is, how long will it last, and how far will it go? Is there a tipping point beyond which the Republicans will go the way of the Federalists and the Whigs? Or is there enough residual value in the affiliation at the state and local level to allow them to re-group at the federal level? It’s not my party, so I can’t say I really care, but I do think it’s an interesting set of questions for the system as a whole. I would so go for another party if any of the third parties looked even half-way plausible. Somebody is trying to restart the Whigs. I’m not sure what they stand for, but on the basis of my enjoyment of political puns, I’m at least semi-supportive. There’s an old Jewish joke about the Klopman diamond and how it comes with a curse, the curse being Mr. Klopman (different surnames get used in different variants). I suspect the Democratic majority comes with a similar curse. What about the libertarians? The Ron Paul supporter types? Do they have the potential to be a mainstream, large-scale third party? Jen, I very much hope not. If Ben Nelson were in the middle of his party, I’d be a Democrat. Which is, I think, why all of the netrooty people dumping on Specter keep comparing Specter to Nelson. Main stream third parties are impossible with our first past the post system. They don’t need to have bad ideas to fail, the system is structurally impossible for them. But, maybe the political scientists can speak to this. I speak based on reading of mathematical simulations of elections (fun topic, BTW) that convinces me that third parties can’t work with our rules. So, a third party isn’t a “third party” but one that’s trying to become a second party. That could happen (it’s happened before), but it’s awfully tough. I’m actually reasonably comfortable with where the middle of the democratic party is right now, and that’s why I can accept Specter with reasonably open arms. Yes, he’ll be a “moderate” democrat, but, if he is a democrat, he may have useful things to say. (But, I’ll have to go check out all the bad things the netrooters have to say about Specter. How does he compare to Lieberman, in addition to the comparisons to Nelson). I still have trouble forgiving Specter for the Anita Hill hearings. me too, though my netroots search isn’t finding anything else terrible about Specter. Anyone want to point me to “netrooty people dumping on specter”? Instapundit had a link on the netroots dumping on Specter. At Unfogged, there seemed to be less than uniform rejoicing, mostly because of Specter’s card check statement. I don’t read the real netrooty sites. The Gail Collins quote is something I’m seeing a lot of, and I think that there’s something missing there. Have Democrats (or Republicans) EVER joined a filibuster against themselves since the Civil Rights Act? I mean, there are several pro-life Democrats, but when an abortion bill comes up, they just vote against it. They don’t join the filibuster against it. So you don’t actually NEED 60 votes — you just need the normal majority, because Specter (like Ben Nelson or Joe Lieberman or anyone else who caucuses with the Dems) isn’t going to filibuster the Democrats. But aren’t there some votes that require 60 votes? for example, people kept saying that the budget needed 60 votes. Was that just to avoid a filibuster? Or are there special procedures, or special procedures they agree to? I still think that if there’s going to be a filibuster, some poor noodle should have to stand there talking on the floor, no gentleman’s agreements. Given the gender and age of the average Senator, you should be worried about the speaker’s prostate, not his noodle. You’re right about the filibuster, bj. What we’ve seen just recently is a huge jump in the number of cloture votes, as the Republican minority in the Senate has decided that it will threaten to filibuster significantly more legislation than previous minorities. Not that our major media will generally tell you that there has been a big change. Here’s a quick chart; more searching will turn up longer series of data. If memory serves, the current Republican minority is on a pace to outstrip the record-breaking use of filibuster threats by the Republican minority in the last Congress. Re 3rd parties incompatible with first-past-the-post: Canada has first-past-the-post for its ridings, and still manages to have 4 parties in its national Parliament in most recent years (currently the Conservative, Liberal, New Democrats, and Bloc Quebecois). There’s also a fifth party, the Greens, which has been working toward a toehold, and might yet get it. Canada manages a multi-party national system largely because of significant differences in politics between different regions of the country. This allows new parties to grow in a particular stronghold area, and sometimes break out (or in the case of the Bloc Quebecois, dominate a particular region). Of course, these regional differences create their own problems in Canadian politics. Yes, a first-past-the-post system doesn’t rule-out a situation with multiple parties so long as only two parties compete in a given area. Also, people don’t always use ‘rational’ reasons for voting and third parties can hang-on for very long periods when they really shouldn’t (see the Lib-Dems in the U.K.). But, the U.S. has a presidential election which would make regional parties and third parties more problematic. But, I wouldn’t say impossible. The Democrats pulled-off over 30 years of basically being two parties (North vs. South) that combined only for presidential elections and picking Congressional leaders. My guess is political socialization is what stops 3rd parties from coming into any strength in the U.S. I hadn’t realized how wide-spread strong party ties were until I moved to Pittsburgh. I read the literature, but I’d never seen it. My guess (based on the rising number of independents) is that this socialization won’t hold forever. Because I don’t really want to join a third party, I want to belong to a majority party, just a different one than either of the two current parties. P.S. This is what I was going to say earlier, but I’m firmly of the belief that inadvertent straight lines are too rare to pass on. I haven’t read Bowling Alone either. I meant I had read the political socialization literature that talks about how party ID is set in early adulthood or earlier. MH, the shortest distance between two puns is a straight line.